The Queen Mary is aglow with lights and a special Diana Exhibit, along with her hotel and dining options. Private parties are a Queen Mary tradition; these two "put on the Ritz." IN MY DREAMS, I'm holding my grandmother's white-gloved hand as we enter the reception area of the Queen Mary. It's the 1950s and I'm a little girl. We're setting off on a glamorous Atlantic crossing, then for foreign ports, elaborate dinners, strolls on the wide teak deck and lively music sessions in the salon. This anchor is part of the many displays in the Queen Mary's many rooms. meals, en suite flowers, champagne chilling in a silver bucket, a string quartet serenading as we sip cocktails. RECENTLY we partook of all that, admiring the waves and formally dressed clientele aboard the Queen Mary. Her grand crossing days are over. She's no longer navigating the seas as the world's most popular and prestigious ocean-liner. But the Queen is still very much a royal part of liner lore, well worth a visit and overnight. WE SPENT a morning with the ship's nattily dressed Commodore, whose passion for the sea is apparent in his every comment and gesture. Beautifully attired in his dress whites, Commodore Everrette Hoard stopped to sign memorabilia and programs for guests, to pose for photos and point out many of the ship's fascinating and historical items. 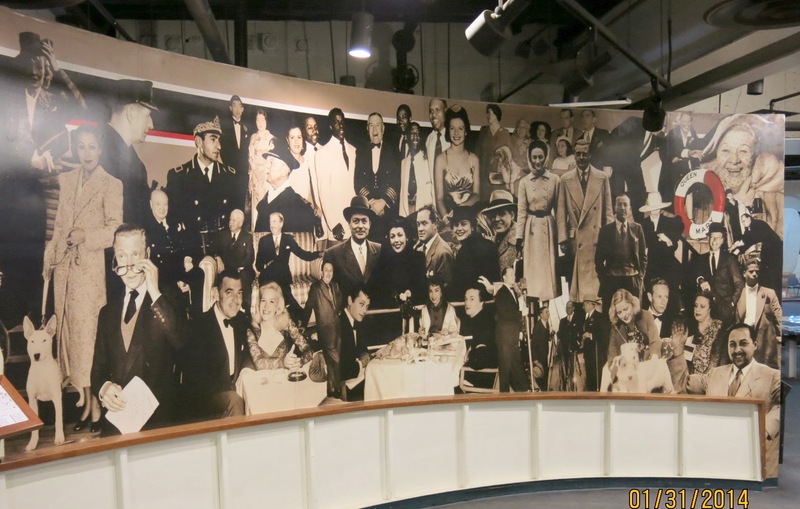 IN ONE PART of the ship, a huge mural of the royalty and movie stars who crossed on her extends across a large wall. Hollywood luminaries, diplomats, and wealthy fans of ocean liner elegance crossed the Atlantic on Queen Mary. with partner Keller and friends, Bob and Sue Hulbert. Commodore Everette Hoard guided them around. David Niven loved her, as did Bob Hope and Clark Gable, the Duke and Duchess of Windsor and the great Winston Churchill, after whom the ship's top restaurant is named. OUR ACCOMMODATING Commodore took us touring, kindly including a stop at Winston's where he invited me to play the piano on which Cole Porter entertained during his happy crossings. It is kept perfectly tuned, regularly played and is an enduring, musical symbol of the Queen's class, elegance and style. Nostalgia seekers will find plenty of vintage equipment to admire. The Queen is also a dog-friendly hotel with several restaurants, an abundance of tours and venues, a spa, several pianos, and plenty of nostalgia. DURING OUR three days aboard, we watched glorious Long Beach sunsets and sunrises from our stateroom and up on deck. We delighted in couples dressed in nostalgic '30s and '40s costumes. The Queen is a well loved, iconic part of life in this port town; many guests dress in vintage clothes to enjoy her and she is beloved as a special-events venue. Winston's is the most elegant of three dining venues aboard Queen Mary. THE GRANDEUR began in spring of 1936, when the Queen Mary departed from Southampton, England embarking on her maiden voyage. The sold-out crossing was elegant and word quickly spread on both sides of the Atlantic -- about the five dining areas and glamorous lounges, pretty cocktail bars, huge swimming pools, grand ballroom, expansive promenades, even a squash court and small hospital. The Queen quickly came to represent a benchmark in transatlantic travel. Before jet travel, the rich and famous considered it the only civilized way to travel and she "seized the hearts and imaginations of the public on both sides of the Atlantic," according to the Commodore. Visitors are welcome to wander the decks, get close-up to the equipment. For three years after her maiden voyage, the Queen Mary was the grandest ocean liner in the world but her greatest calling came during World War II, when she became "the grey ghost," helping win the war for the Allies. named after the prime minister who helped save England. When the Queen Mary docked in New York in September 1939, it was the last time she would carry civilian passengers for nearly eight years. She was overhauled for the troops, painted a camouflaged grey color and stripped of her luxurious amenities. Dubbed the "Grey Ghost" because of her stealth and stark color, the Queen Mary was the largest and fastest troopship to sail, capable of transporting as many as 16,000 troops at 30 knots. They slept and ate in shifts -- so large were their numbers. Many believe the Queen and the troops she carried helped end the war. COMING UP: The Queen Mary sailed another 20 years as a passenger liner after her war service, and continues into the 21st Century at the age of nearly 80, as a delightful floating hotel with a world class restaurant, Winston's, named after a frequent guest. Her teak desks are still beautiful and her bridge is kept shining. Commodore Everette Hoard sees that she is alive, well and continuing her proud legacy.